Each year the children decide upon their class rules and the rights associated with these. All the children contribute to the drawing up of these rules. Every child on the School Learning Council is voted in by their class. 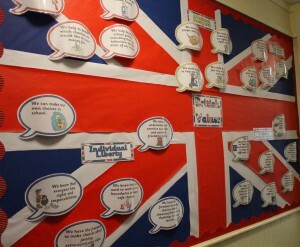 Children are able to put forward their views about the school and there are regular School Learning Council meetings. The importance of rules/ laws whether they are those that govern the class, the school, or the country, are consistently reinforced in one form or another in school on a daily basis and further reinforced through dealing with specific examples of poor behaviour, school assemblies and interactions with parents. Within school we prominently display our school values on which the school rules are based. St Mary’s is a diverse school and our community comes from a wide range of backgrounds and cultures. We actively promote diversity through our celebrations of different faiths and cultures. Religious Education lessons reinforce messages of tolerance and respect for others. Members of different faiths and religions are encouraged to share their knowledge to enhance learning within classes and the school and the children learn about and where possible visit, places of worship that are important to different faiths. At St Mary’s we will actively challenge pupils, staff or parents expressing opinions contrary to fundamental British Values, including ‘extremist’ views. We will also challenge racism and expect everyone within our community to respect British laws whilst supporting their own culture.